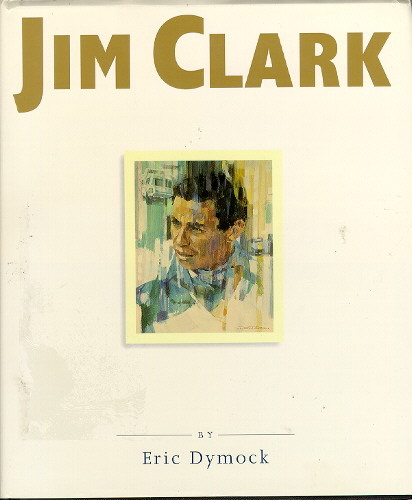 Eric Dymock wrote this 256 page "Tribute to a Champion", first published hard cover in 1997 by Dove Publishing, Old Chapel House, Suttom Veny, Wiltshire BA12 7AY. It was subsequently re-printed by G.T. Foulis & Company, a division of Haynes Publishing, Sparkford, NR Yeovil, Somerset BA@22 7JJ. The book is lavishly illustrated with black & white and color photographs and prints, and also with images of racing programs, brochures, flyers and other memorabilia of the 50's and 60's racing scene. The goal of the book is to "..reinstate the memory of the noblest of racing drivers...", and I think Mr. Dymock has done well. It shows the many interesting facets, of this very public, very much loved, very talented driver. Mr. Dymock chronicles Clark's childhood, his early career, his rise to stardom, and his un-timely death. But... Lotus Cortinas are barely mentioned. Oh well. A black & white photo of the Cortina being driven down the bob-sled run at Cortina Italy is found on page 15, a beautiful double-page reproduction of Michael Turner's 1991 commissioned painting of the RAC rally showing 2 Lotus Cortina MKIs being assessed for damage, is on page 238-239, and a small black & white image of KPU 396C slightly off the track, on page 245... and that is it. It is no longer available new, and must be found on the used market.